SITA 15th January 2009 In Murgašova Street in Košice there is a building belonging to the Honors company that produces the cold and heat for itself. Neither gas, nor coal, wood or any other fuel is needed for its production. Only ordinary water from wells is sufficient for it. The well, from which the water is pumped, is used for the production of the cold and the heat. It cools in the summer and in the winter there is a heat pump that takes the heat from it and heats the place. Climate changes have brought the thermal waves that cause the collapses from the heat. If the daily temperature rises above 30 degrees, especially older or ill people are in danger. The number of the collapses in hot days reaches 100 and more people per day in Slovakia. The recommendation to the public about the drinking regime and the time spent on the Sun can only partially solve the situation. The scorching heats cause the rising risk of the organism collapse up to 33% if a person is exposed to the heat for 48 hours. The organism suffers the thermal stress. The solutions is represented by the interruption of 48-hour-cycle in an air-conditioned place during several hours. 30 thousand citizens of the EU died in 2003 as a result of the heat. In 2010 it was 55 thousand. A condition for the achievements of the human thermal conform is to reach the balance of the thermal regime of a person necessary for the preservation of stable body temperature. A man at office reaches the energy output of 65 to 70kW/m2. It doubles within the tiring work. The created energy has to be expelled from the body. Many people have negative experience with the air conditioning that blows the cold air to the room space. It is because the cooling of the space in buildings by the means of blowing cool air causes a lot of negative effects on a human. A man needs the environment where there is a low movement of the air in order to keep the thin layer of the micro climate on the skin. It is because we have the thermal sensors in the skin and they inform our brain about the temperature and the regulation of energy exchange produced in the organism with the environment.However, if we blow the cool air that cools the space, the movement of the cool air removes the micro climate from the skin. The result is that the information from the skin dims the fact and thermo-receptors inform the brain about the lower temperature than the actual one. It leads the organism to the reduction of the energy output through the skin and the result is that the energy accumulates in the organism. If a person gets out of such a space, the organism starts to get correct information about the temperature and it starts to cool itself and expel the accumulated energy from the organism. However, at the temperature of 30 degrees and more, the organism can reduce the heat only by the mechanism of evaporation - a person sweats. It causes the significant loss of liquids that have to be added. The cooling systems that cools the space by blowing at the same time dries it. It often happens that the drying of the air gets under the hygienic level of 30% of relative humidity. The fanning by cool and dry air in the offices often causes headaches, inflammations, sometimes migraines and it significantly reduces the ability to work. Finally, we know frequent shortenings of working time during the heats or the recommendations of holidays. Employees often solve the problem so that they leave the office for 2 hours and let the space cool down, then switch off the air-conditioners, then work for an hour and then repeat the cycle. It significantly reduces the productivity of work, whether by the diseases of dizziness or interruption of work. 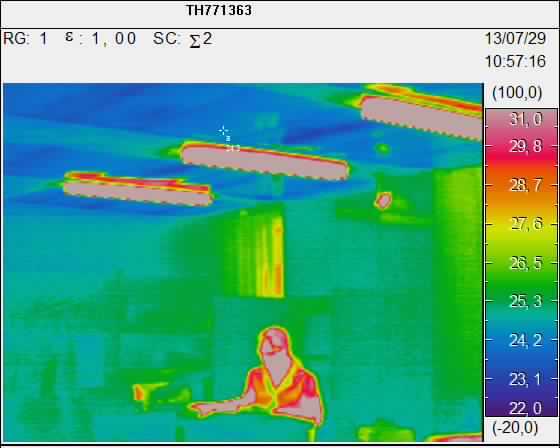 The pictures of vertical temperature course in the offices cooled by radiant ceiling system made by an infra-red camera. External temperature 34oC. If a person visits a cave, he will see that these phenomena do not happen. Modern cooling systems that respect the human characteristics and the method of cooling enable to create a cold environment in buildings even in hot summer. They are the radiant ceiling systems and cooling systems that do not whirl the air. 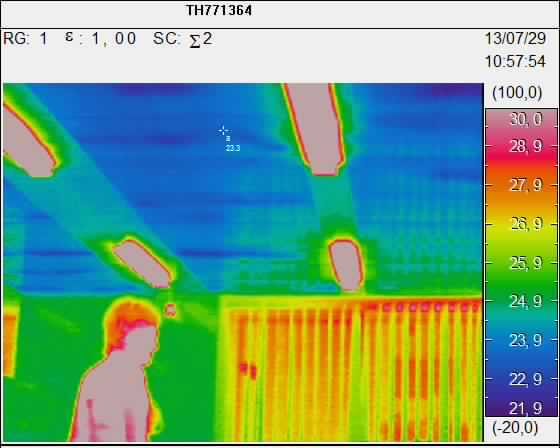 Like the Sun heats the rooms through the windows by the radiation in the winter, this cooling system uses the radiation for the transport of energy and it cools the walls and floors of a room and the air is subsequently cooled from them. It's as if you have visited the cave. The skin gives the correct information about the temperature of the environment and thus the thermal balance of the organism is equal to the environment and a body does not accumulate energy. The organism is not stressed in such a cooled space. Then even the passage to external environment after leaving the building is not accompanied by immediate sweating. If you stay in such a cooled place it seems like being in a cave with the temperature suitably regulated for human work. During the time spent in such a cooled place for 4 and more hours, there is the interruption of the thermal wave that lasted for 48 hours or more; the risk of organism collapse reduces to the original level by up to 33%. It happens because there is not any thermal stress put on an organism in the space and the organism can have an adequate rest from it during this time. The solution is based on the use of the system of micro-capillaries placed in a ceiling and water from a well. 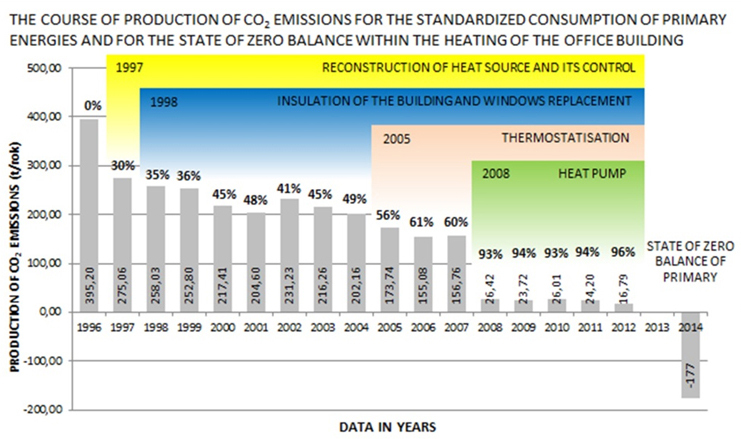 We are able to heat the 7-floor office building with the area around 4,400 m2 that is approximately the area of 55 3-room flats to the temperature set for offices, says one of the co-authors of the project, a civil engineer, Mr František Vranay, a teacher at the Civil Engineering Faculty of the Technical University of Košice (TUKE). It is a device that uses the energy potential contained even in low-temperature water. 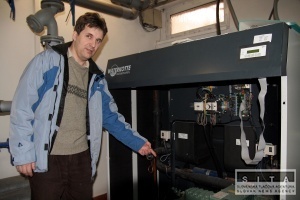 The device has been in operation since November 2007 and it still uses the renewable energy for the heating of the building. 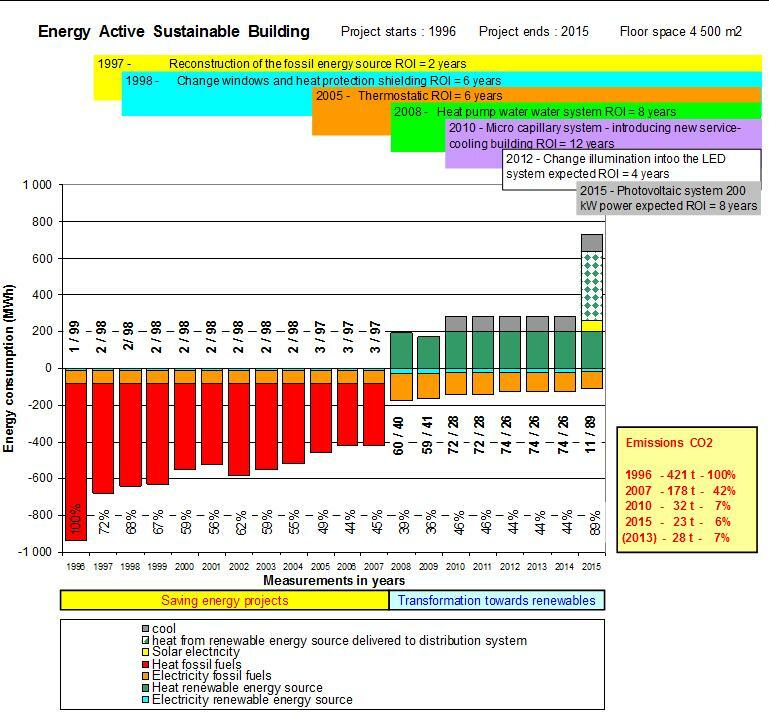 The technology is projected for 40 years, while the energy source is inexhaustible, says Vranay. He added that the idea of use of the energy potential for low-temperature water originated in 2006. The agreement for the cooperation of the project realisation was signed among the Civil Engineering Faculty of the Technical University of Košice (TUKE), Faculty of Electrical Engineering and Information Technology Bratislava and Honors company that financed the project. Vranay said that it is a known technology. Their contribution is that the solutions proposed by them are not only realisable but there is the economy return of the investment a in a good time horizon. It is a practical example of almost immediate realisation of the knowledge economy in practice. As the auditor for the sector of heating and thermal system, Mr. Ľudovít Tkáčik stated this source can be used in large in the whole floodplain around the river Hornád and in the places where there are abundant groundwater resources. In the area of the city the energy potential contained in low-temperature water contains more than 1.2 million GJ that is 1/4 of the actual need of heat in Košice. This source will be used by inhabitants of the city also because they will not have to pay the emission fees included in the price, what is approximately 15% of the heat price, says Tkáčik. We want to capitalize on the gained experience and knowledge that is why we established the Research Centre of the Economy of Renewable Energy Sources and Distribution Systems in Košice, says the representative of Honors company Mr.Dušan Lukášik. The members of the association are the join stock company Honors, Tuke, STU and Economy University of Bratislava. The main aim of the association is to contribute on the increase of the renewable energy sources use, to create the conceptions of practical realisation of solutions dealing with the emissions reduction, to propose the recommendations for the legislative and at the same time to connect the education with the practice. 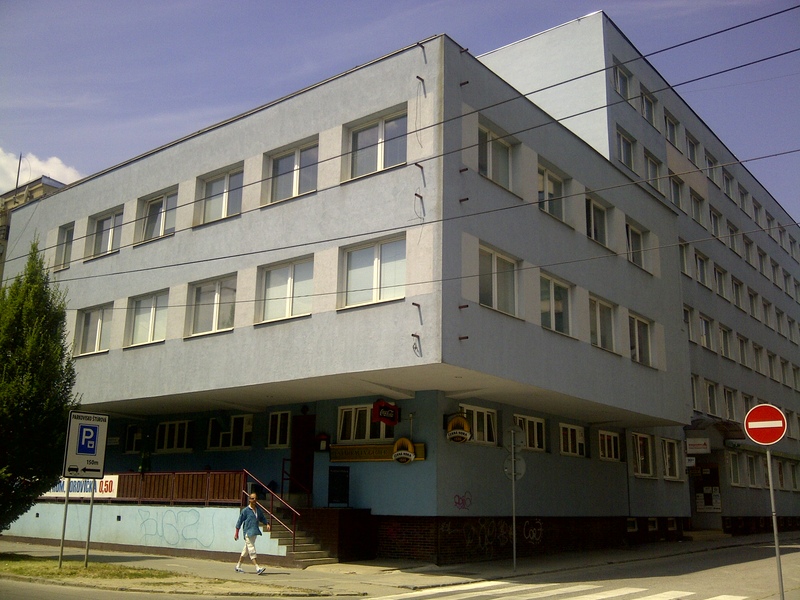 Therefore a laboratory was founded in the object in Murgašova Street in Košice where there are the lectures for the students of three faculties of TU Košice, said Mr. Lukášik. He added that the alpha and omega of renewable energy sources use is the acquisition of standard economy parameters in order to realize the solutions with the use of the sources from the commercial banks. Information on the site are copyrighted, subject to certain contractual arrangements. Misuse of these data is punishable by law.